What is Weaving in Textile? In textile manufacturing industry, the fabrics which are produced by using two sets of yarn named warp yarn and weft yarn by interlacing among them is termed as woven fabric. The whole process of woven fabric manufacturing is known as weaving. Woven fabrics is produced in weaving factory by using power loom or hand loom machine. What is Knitting in Textile? The fabric which is produced by using one set of yarn by interloping in textile industry is termed as knit fabrics. The whole process of knit fabric manufacturing is called knitting in textile. Knit fabric is produced in knitting factory by using flat knitting machine or circular knitting machine. 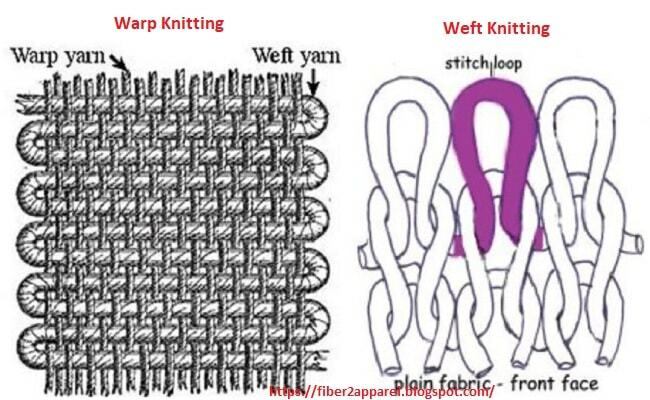 What is the Difference Between Weaving and Knitting? In textile industry, knit fabrics are produced by set of connected loops from a series of yarns. In textile industry, woven fabrics are produced by the interlacement of two sets of yarn named warp yarn and weft yarn. Sizing is not required in case of knitting. Sizing is required in case of weaving. One set of yarn is used in knitting process. Two sets of yarn are used in weaving process. Yarn preparation is not needed in knitting. Yarn preparation is mandatory in weaving process. Knitting production cost is less than weaving. Weaving production cost is higher than knitting. Production capacity of knitting is more than weaving. Weaving production capacity is less than knitting. In textile industry, 52% fabrics are produced by following knitting process. In textile sector, 48% fabrics are produced by following weaving process. Elastic properties of knitted fabrics are higher than woven fabric. Elastic properties of woven fabrics are less than knitted fabric. Knitting is performed by following loop formation technique. Weaving is performed by following shade formation technique. Dimensional stability properties of knitted fabrics are less than woven fabric. Dimensional stability characteristics of woven fabrics are higher than knitted fabric. One needle is used in knitting process. Heald eye or frame is needed in weaving process. There is coarse and wales in knitting. There is warp and weft in weaving. Waxing is required in knitting process. Waxing is not required in weaving process. Knit fabrics are more resistant to crease. So it requires no ironing. Woven fabrics are more inclined to crease. So ironing and iron retention is better than knit fabrics. Fabric strength is higher than woven fabric. Fabric strength is lower than knitted fabric. Less durable than woven fabric. More durable than knit fabric. Knit fabric absorbs more moisture than woven fabric. Woven fabric absorbs less moisture than knit fabrics. Twist per inch (TPI) of yarn is less in knit fabrics. Twist per inch (TPI) of yarn is more in woven fabrics. Drawing, looming processes are not required in knit fabric production. 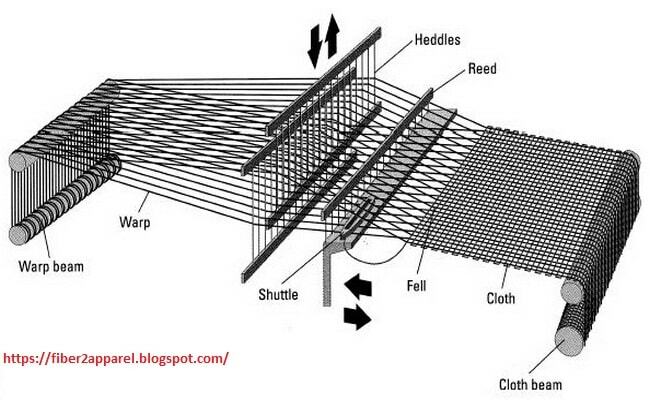 Drawing, looming processes are required in woven fabric production. Air permeability is more due to voluminous structure of knit fabrics. Air is less permeable due to compact construction woven fabrics. It needs less labor cost during manufacturing process. It needs higher labor cost during manufacturing. Knit fabrics are cool and breathable. Woven fabrics are thick and wind resistant. Knit fabric is comfortable to put on. Woven fabric is not more comfortable than knitted fabric. No seam finish is required in knit fabrics. Requires seam finishing preventing ravel in woven fabrics.